I think this is a Federal 605 wrecker. Truck, 7 1/2 Ton, 6x6, tractor, Wrecking, Type C-2 (Federal 605). 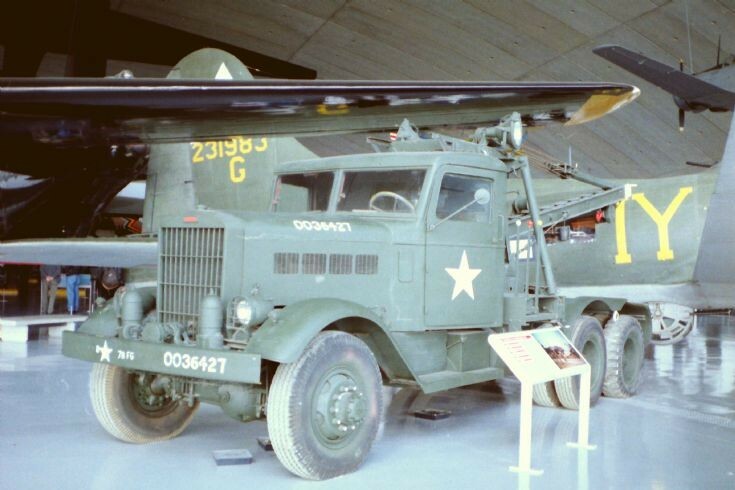 Early C-2 models had a Garwood 10-ton capacity gooseneck boom crane. All USAAF wreckers had an underslung winch at the rear, air-assisted steering, inertia type starter and air springs at the front. They were used to salvage crashed planes and to perform general towing duties and were fitted with a 5th wheel with a payload of 13000 lbs. C-2's were also built by Biederman which had a different style of cab to the one in your image. The above info is an extract from The Observers WW2 Fighting Vehicle Directory by Bart Vanderveen. Added by Roger Mason on 20 January 2014. The REO built C-2's were equipped with a 3 Kw 110 volt DC electric power plant and flood lights, which can be seen at the rear of the cab roof. Added by Stephen Prosser on 22 January 2014. Added by George Fiebe on 04 February 2014.